The rich creamy flavor of avocados is like a fountain of culinary potential. Guacamole, salads, soups, spreads and smoothies are a few of its many uses. 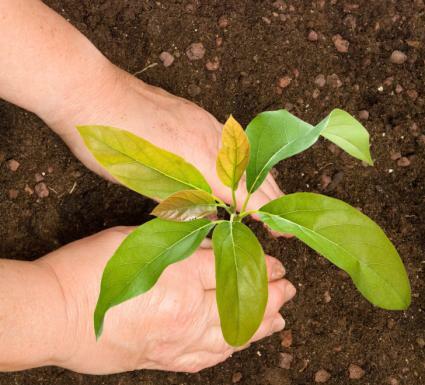 If you'd like to try your hand growing them at home, take these tips into consideration before planting a pit to make sure that you'll be able to give the tree everything it needs to go from seed to table. The first thing to realize about growing avocados is that they don't always grow to true to type from seed because they are generally produced on grafted trees. Plant the pit of any store bought avocado in a 5 gallon pot filled with a lightweight potting mix. Bury the pit about 2 inches deep and keep the soil moist until it sprouts, usually within two to three weeks. Once the sprout has a couple of full size leaves, you can let the top of the potting soil dry out a bit between watering. Planting a pit is also a fine way to get started making a fruiting avocado tree, as the sprout that grows can serve as the rootstock for grafting a fruiting variety onto at a later date. Once the seedling is between 1/4 and 3/8 of an inch in diameter at a point 6 inches above the soil line, it's ready for grafting. Grafting takes some practice if you've never done it before, so you may want to sprout a number of seeds to experiment with if it's your first time. There are many styles and techniques of grafting that can be employed with avocados, but the basic concept is to cut a 4 to 6 inch stem from an avocado tree of known fruit quality and splice it onto the seedling, which is called the rootstock. The grafting material is referred to as the scion and should be the same diameter as the sprout you're going to graft it to. Ty McDonald of the Kona Cooperative Extension discusses avocado grafting and everything you need to successfully propagate them in a detailed two-part series from the Hawaii Tropical Fruit Growers, posted by their Executive Director Ken Love. If grafting your own avocado tree sounds too complicated, you can always elect to purchase one that is ready to plant. Be aware that most varieties will reach 30 to 60 feet tall at maturity, so consider whether you have the space for a full-size tree or look for one of the dwarf varieties, such as Littlecado. If you live in a climate where winter temperatures regularly drop below freezing, you'll also want to purchase a dwarf tree, as this gives the option of covering it in the winter or bringing it indoors to a bright sunny room or greenhouse. Once your avocado tree is 3 or 4 feet tall in its pot, it is time to either put it in the ground or graduate it to a larger container. 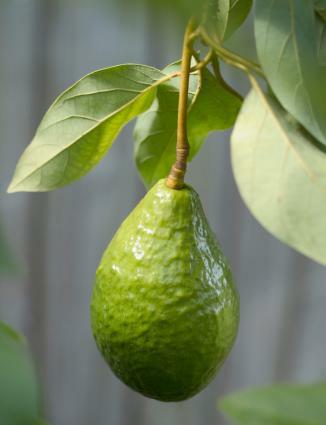 A dwarf avocado can live its life in a container of at least 25 gallons in size, such as a wine barrel planter. The same is true for an avocado that is grown only for its foliage. A standard size fruiting avocado can grow for several years in a container of this size, but it it will eventually be come stunted and is unlikely to ever produce fruit. Of course, you don't have to go straight from a 5 gallon pot to a 25 gallon one, you can pot it up in a slightly bigger container each year as it grows instead. Just be sure to use a well-drained potting mix with plenty of perlite for good drainage - avocados don't like their roots in heavy soil. After all danger of frost has passed in spring is the optimal time to transplant a young avocado tree to a permanent position in the landscape. It needs eight to 10 hours of direct sun each day to fruit well, though they will survive and look lovely with a half day of sun if fruit is not the goal. Drainage is key. If planting in heavy clay soil, build up a gently tapering mound of soil about eight to 12 inches above the surrounding grade to ensure the area around the root crown drains freely. If the soil already drains freely, it is fine to plant it without changing the grade. Incorporate several bags of compost into the planting area and plant the tree so the top of the roots are even with the soil level. Water it in deeply at planting time and spread several inches of mulch over the planting area to conserve moisture and keep the roots cool. Growing an avocado tree is a long term investment that results in a beautiful, fruitful shade tree - or a unique, attractive patio tree for the dwarf varieties. If you don't live in the ideal subtropical avocado habitat, however, a fair bit of care, maintenance and troubleshooting may be necessary to grow a healthy, productive tree. Avocados are not drought tolerant, so plan to give young trees a deep soaking once per week; with established trees, leaving a sprinkler on under the canopy for several hours once every two to four weeks, depending on the temperature, is sufficient. From late fall through early spring, the soil is likely to be cool and moist, so it's generally not necessary to water at these times. Immature trees can be fertilized about once per month during the growing season with a balanced all-purpose fertilizer, such as 10-10-10 to help sustain vigorous growth during the establishment period. Over time, the tree should become more and more self-sufficient in its nutrient needs, but if the leaves look pale and yellow, giving the tree a dose of fertilizer should help to green it up. If the leaves are yellow, but the veins remain green, the avocado is probably suffering from an iron deficiency. Iron chelate is a readily available form of iron that can be applied to the soil as a remedy. Follow the instructions on the package for application rates. If organic methods are desired, spreading a 2 inch layer of composted manure over the root zone of the tree each fall is an excellent way to provide a well-rounded, slow release dose of fertilizer to the tree. Cover the manure with 2 inches of mulch each year and you will quickly create such rich and balanced topsoil that nutrient deficiencies are very unlikely. Aphids, mites, scale and other tiny, sap-sucking insects are the primary pests affecting avocado trees. These are often found in small populations on mature trees that don't pose a threat to overall health and productivity. If there is an outbreak on a young tree, spraying the tree with a mild dilution of soapy water or just a strong spray from the hose with plain water on a regular basis will keep them in check. Avocados are susceptible to a number of fungal pathogens, all of which thrive in excessively damp conditions. They are difficult for homeowners to treat successfully, making prevention the best option. Planting on a mound, as previously mentioned, is the best defense against root rot, a common avocado ailment. If there are white or grey spots on the foliage, powdery mildew is the likely culprit. In this case, steps can be taken to improve air flow around the tree, such as cutting back other dense vegetation nearby and pruning out closely spaced branches on the tree itself. Don't be surprised if it takes many years for your tree to begin to produce fruit - orcharding is not a hobby for people in a hurry. 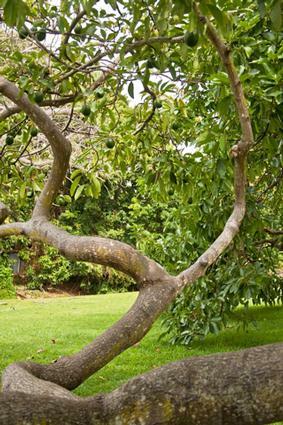 Avocados are slower than most fruit trees to produce their first crop; five years or more from the grafting stage is not uncommon, though dwarf avocados may begin to produce in as little as two or three years. Winter is the primary season for harvesting, though exactly when depends completely on the variety. They are picked when hard and allowed to soften on the kitchen counter before eating. The immature fruit has a glossy sheen that disappears when it is fully ripe and ready for harvest. Growing avocados is a challenging, long term project for the determined gardener, but is well worth the effort for all the learning involved and the eventual reward of a homegrown harvest. Avocado trees are so productive that even with a dwarf avocado you will eventually have more than any person or family can eat themselves, leaving you with a wonderful gift to share.